Stunnning 12.25" Tirrube vase with handpainted white roses and vines on a red bisque body, circa 1905-1908. In excellent condition. 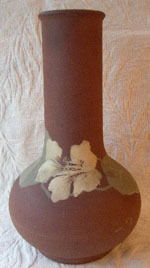 Lovely 9 1/2" Clifton Pottery Tirrube bottle shaped vase painted with an ivory Nasturtium and celadon foliage on a bisque fired ground. Stamped Clifton 148. 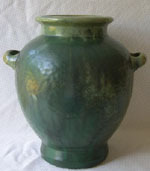 Clifton Pottery was founded by William Long in 1095 in New Jersey. The pottery operated until 1908. In excellent condition. Stunning three double gourd vase group by Donna Craven. Donna comes from a long line of North Carolina potters. She is a very talented artist that is just coming into her own with major exhibitions in North Carolina museums. The vases measure 22", 16" and 14" and are in excellent condition. 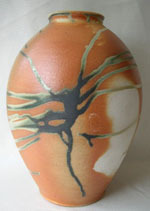 Outstanding 14" floor vase with eye catching spider glaze from well regarded potter Fred Johnston. This piece speaks for itself. In excellent condition. Majestic 13" Fulper vase with a cucumber to Flemington green glaze and classic shape. In excellent condition. 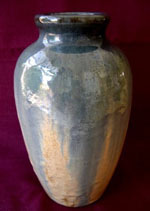 Magnificent 9" Fulper baluster vase with mirror black over copperdust crystalline glaze. Owing to the thickness of the glazes the oval incised stamp is very faint but visible along with the model number dating this piece to 1916-1922. In excellent condition. 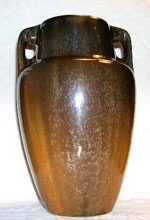 Frothy 8" Fulper vase in beautiful butterscotch flambe glaze, circa 1922-1928. In excellent condition. Stunning Fulper 7.5" corseted vase in a combination of mahogany, mirror black, ivory and blue flambe glazes, circa 1916-1922. 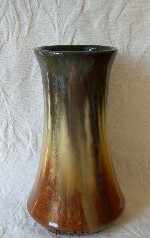 With the exception of a glaze pop and a factory overglazed rim indent, the vase is in excellent condition. Please email us for additional pictures.